So I know I have been a virtual no show in the last week and some change. I apologize about my poor blogging. After returning from my short (It was too short! I could have stayed a bit longer.) trip to Dublin I had some work responsibilities, a test in my Czech class, some random chaotic happenings, a quick 22 hour trip to Berlin for my Visa, and on top of it all I caught a bug that I can’t shake. With that being said, please pray for my health. I’ve had no voice pretty much all week and I’ve been exhausted. Yesterday and today I stayed home, which was very hard, but very needed. I feel better, but my voice is still away from me. Maybe I left it Ireland. I’m not sure. But I would appreciate some prayers for my health. God surely is trying to get me to slow down a bit; which is something I struggle with. 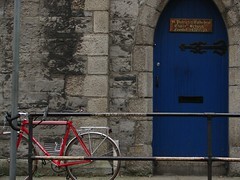 Anyways… Here are a couple of my favorite pics from Ireland and a couple other goodies I decided to throw in. I hope to get some posts up this weekend. And after a few years I was again in Britain with my parents [kinsfolk], and the welcomed me as a son, and asked me, in faith, that after the great tribulations I had endured I should not go an where else away from them. And, of course, there, in a vision of the night, I saw a man whose name was Victoricus coming as it from Ireland with innumerable letters, and he gave me one of them, and I read the beginning of the letter: â€˜The Voice of the Irishâ€™, and as I was reading the beginning of the letter I seemed at that moment to hear the voice of those who were beside the forest of Foclut which is near the western sea, and the were crying as if with one voice: â€˜We beg you, holy youth, that you shall come and shall walk again among us.â€™ And I was stung intensely in my heart so that I could read no more, and thus I awoke. 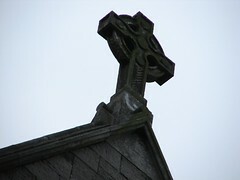 Thanks be to God, because after so many ears the Lord bestowed on them according to their cry. 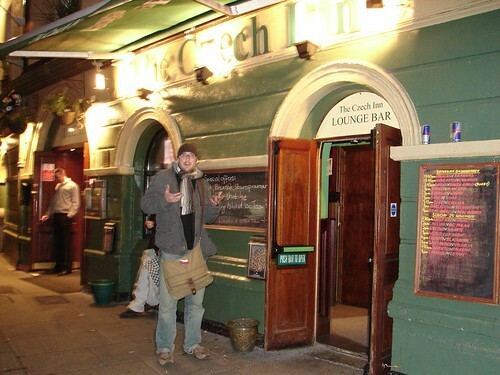 Jason and stumbled across “The Czech Inn” in the middle of Dublin. Kind of funny, especially since Jason works at The Czech Inn hostel here in Prague! 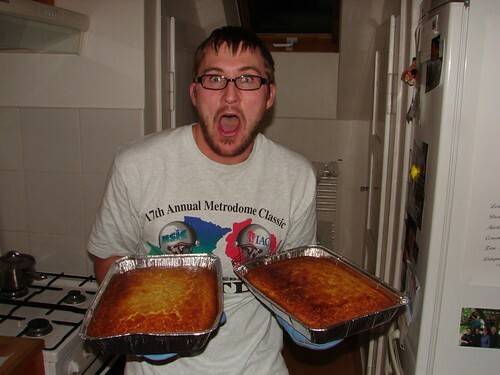 Oh and I baked last weekend! That’s right, I baked! I was so proud of myself I had to take a picture. 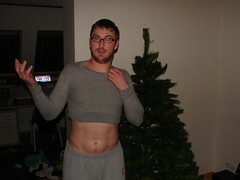 Yeah, that fit me a week ago, now it looks like I stole a sweater from my director’s 5 year old daughter! Praise God for the humbling moments. Ernie, my roommate, and I got a good laugh from it. Well, I have to get going. We have our AIA Christmas party tonight. Look for a blog post about Czech Christmas customs! So, did you go in the Czech Inn? Patrick is the man, Zach. You are right. Amazing biography and deep life of God. No I didn’t enter the Czech Inn in Dublin, well kind of. I opened the door looked in and realized it wasn’t what we wanted. So we left. I’m sure it would have been a delightful experience though.